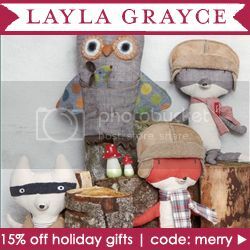 'Tis the season to shop and Layla Grayce is offering 15% off all holiday gifts with promo code merry valid through 12/23! Find a gift for everyone on your list! Delight your mother, sister or best friend with a Stephanie Johnson Palm Desert White Snap Mirror. A zebra-inspired print in metallic gold provides this on-the-go mirror with the high-profile glamour of a desert oasis. The Kirra Tate Chevron Blue Bracelet Set adds style to any outfit and makes the perfect gift for the holidays. Don't forget about the children on your list! There are plenty of cute ideas for them too! Don't miss your chance to save 15% on fantastic holiday gifts!